His first feature film was the seminal “Sky Captain and the World of Tomorrow”. Later on he was part of the team that won the Oscars for best achievement in visual effects on “Golden Compass” and “Life of Pi”. And just some of his recent work includes “Captain America: The Winter Soldier”, “Fast and Furious 7”, both parts of “The Hunger Games: Mockingjay” and the most recent “Captain America: Civil War”. 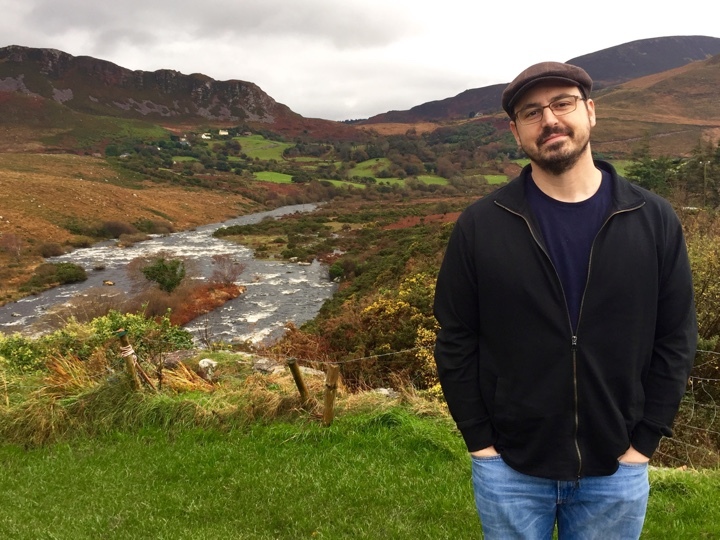 It gives me great pleasure to welcome Jay Grunfeld to the ongoing series of interviews on fantasy user interfaces. In this interview Jay talks about his last ten years working primarily as a digital compositor on a variety of productions, the ongoing evolution of tools and artistic capabilities of software tools at his disposal, holographic screens and their applicability in the real world, and his excitement about the virtual reality revolution. We also talk about his work as the visual effects supervisor on “Mockingjay”, its technology, screen and holographic projections. Jay: My name is Jay Grunfeld and I work as a visual effects compositor/supervisor. I was born in Brooklyn, New York and was raised in New City, NY, a suburb of NYC in the Hudson Valley. Growing up, art and talent surrounded me. My parents knew early on that I had an eye and encouraged me to take courses at the Arts Students League and the School of Visual Arts for high school students, in addition to providing me with private lessons as well. My greatest influence is my dad, a graphic designer and a graduate of Art Center here in LA. We worked on a bunch of projects together and he was always encouraging me to try everything and anything because it always leads to something. I went on to study photography at Cal Arts. The idea of capturing a moment in time within a frame always intrigued me but now, I create instead of capture. Unfortunately, Cal Arts suffered terrible damage due to the Northridge quake of ’94, so I spent the next six months in NY and began learning Photoshop. After college I became interested in motion graphics. One of my early jobs was at The Picture Mill. This is where Stephen Lawes and I first met. Stephen would later hire me for my first job as a compositor on “Sky Captain and the World of Tomorrow.” “Sky Captain” was a truly innovative film as a good portion of it was computer generated. It was a feeling of freedom with an entire large canvas to create. It was on this film that I knew I had found the work I wanted to pursue. 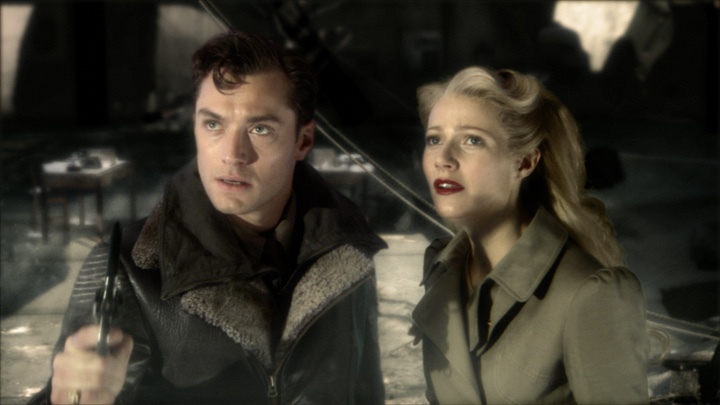 Scene from “Sky Captain and the World of Tomorrow”. Courtesy of Jay Grunfeld. I spent the next few years working at Entity FX as a compositor, which led to Rhythm & Hues where I was part of the creative team that earned Oscars for “The Golden Compass” and “Life of Pi.” I am incredibly proud to have been a part of these films. You could say I earned my masters in compositing at R&H. Presently, I am working at Cantina Creative. Stephen Lawes and Sean Cushing, co-owners of Cantina, have created a special, supportive environment in which to work. They both encouraged me to try my hand at supervising, which is very challenging and fulfilling. Wearing a different hat within the process I thought I knew so well was humbling. Jay: I never imagined working on feature films so I really had no expectations. I was always leaning towards fine arts/photography. After my experience with “Sky Captain,” I fell in love with VFX. It is extremely challenging but so rewarding. I knew then I wanted to spend my days in VFX. It’s really about the team aspect of working with different types of artists, each with their own specialty, putting their collective talents together for the same purpose. 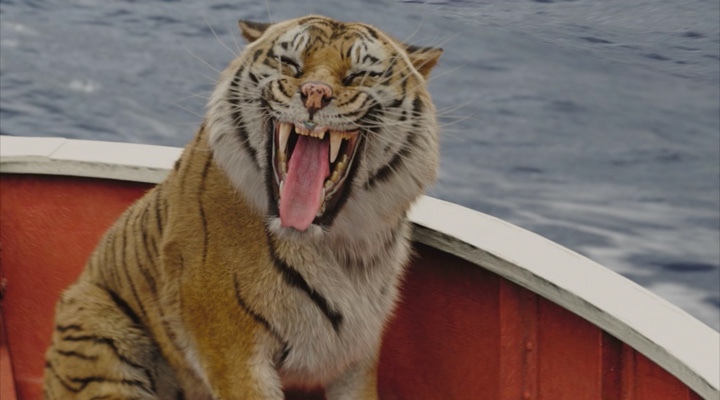 Tiger smile from “Life of Pi”. Courtesy of Jay Grunfeld. Kirill: You’ve worked on multiple productions as a compositor. What does a compositor do, and how do you introduce yourself and talk about what you do for living? Jay: It’s very hard to explain what I do. It’s a world of a great amount of detail and painting it with a broad brush gives it no justice. I normally say something like ” I’m a digital chef” taking all the elements, combining them together to make something seem real. The public has no idea what goes into each frame, it goes by so quickly and looks seamless. The work done on the hair on an actor’s head or that of a bear or tiger in “Golden Compass” and “Life of Pi” respectively, took hours of backbreaking work to look real. Kirill: What are your thoughts on the evolving capabilities of digital tools at your disposal in the last 15 years? Jay: The digital world has allowed the artist the freedom to create whatever the imagination can dream of. The evolving tools make it easier and faster and seems to be without constraint. That being said, Tools are only tools. 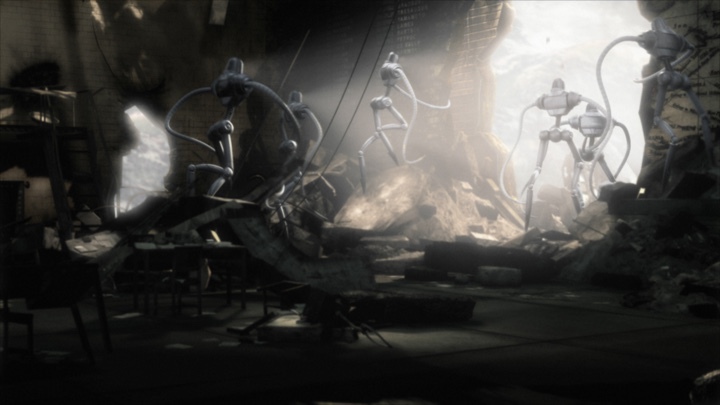 It’s really the artists capabilities that with such tools have pushed the capabilities of VFX. I’m curious to see the evolving tools, as well as the evolving artist. Kirill: Can anything and everything be created in the CG world these days? Are we anywhere close to the “dream” explored when you’ve worked on “Sky Captain and the World of Tomorrow” where everything was green screen and post-production? Jay: I think anything can be done. Shooting without an environment has become common. 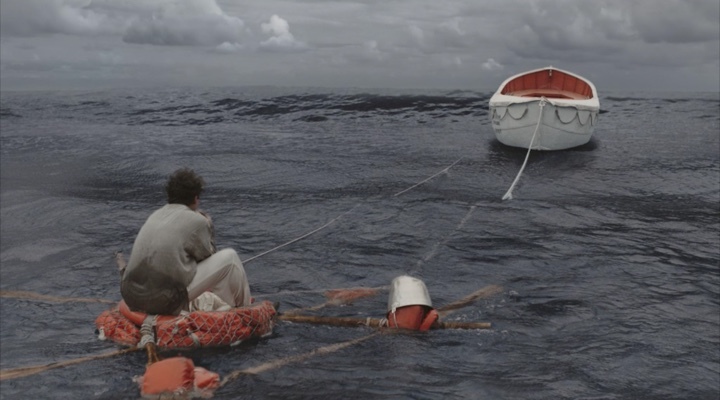 Most of the shots in the ocean in “Life of Pi” were filmed in a water tank surrounded by blue screen. The same goes for “Gravity” and, more recently, “The Jungle Book”. Even if an actor unfortunately passes during filming, and the film has gaps that need to be filled, there’s a solution. 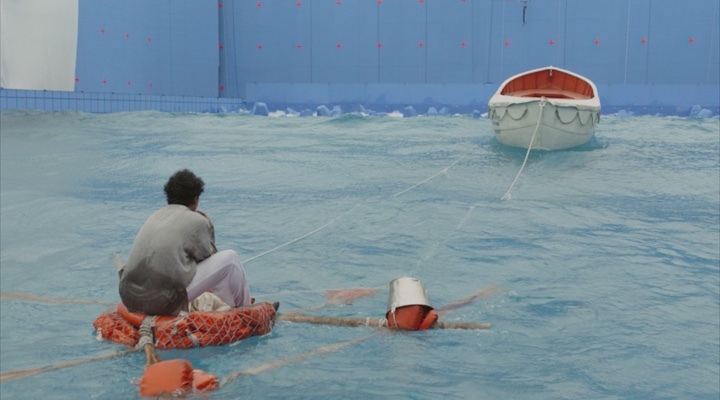 Filming a scene in “Life of Pi” in blue screen environment. Courtesy of Jay Grunfeld. Final still of the same scene. Courtesy of Jay Grunfeld. Kirill: On a related subject, what are your thoughts on the recent push back from some moviemakers to move from digital back to shooting as much as they can in camera? Jay: Some would argue that the pushback is from the lack of quality. That has everything to do with the studios and the unrealistic time demands they put on post-production overall. Putting politics aside, I think “Mad Max” would have suffered if it were all CG. The reality is that any limitations in CG go hand in hand with time and money. Jay: I think we’re safe for now. Until we have holograms telling us our breakfast is ready or that our teenager just took the car out at 3:00 AM, we have some time to stretch our legs…as long as we keep a good lead. But I think it’s all about balance. The world you’re creating for ultimately decides the path you take. With “Mockingjay,” we had to keep the graphics within the technology available in that dystopian world and make it believable. Pushing it too far became painfully obvious. Screen graphics on “The Hunger Games: Mockingjay – Part 2”. Courtesy of Cantina Creative. Kirill: As you’ve joined the existing universe of “The Hunger Games” on the two “Mockingjay” movies, what kind of initial research and exploration did you do to understand and, perhaps, expand, the technology world of the franchise? Jay: The aesthetics were established quite well from the on set graphics that Venti Hristova designed. It was a very Cold War, information-based language. So anything we did couldn’t wander too far from that. We went through some initial designs and landed on something everyone thought was believable and balanced for the world. Jay: I wouldn’t say constrain. The look of almost everything was already somewhat established on “Mockingjay – Part 1.” The holograms were a sophisticated advancement, but we had to stay within the technology already established. Kirill: What kinds of discussions take place around defining the visual language for screen graphics and holograms to make them feel as an integral part of that world, and who participated in those discussions? Jay: Well, we had a base language established early from the onset graphics. So the language had it’s range. Initially we get direction from our client. For “Mockingjay” it was Francis Lawrence and Charlie Gibson. We get a feel for their vision and intended use for the graphics. We bring these ideas back to our office where the artists then brainstorm and create. Kirill: What was your approach to designing the holographic interfaces on the second movie? They are edgeless and quite dense, and yet do not feel out of place in their sets. Jay: There was extensive thought into making something feel realistic and believable. We begin with what the viewer has to easily understand. We hit the story points and then design and work around those main ideas. Then we see how far we can push it to make it work. Kirill: What were the main technical challenges in incorporating the holograms into the existing shots? Jay: I would say the exposure of the plate. We can agree a hologram looks best in low light. It would be quite difficult in a field with mid-day sun. Other than that, it can easily get very heavy and dense. Holograms look best clean and simple. Kirill: On a related subject, what are your thoughts on holographic screens and environments? Is this more of a great cinematic tool to convey the complexity of the interfaces? Putting aside the technical aspects of making such interfaces a reality, do you see real-world applications for our work and home environments? Jay: I think it would be really cool to watch a hologram football game while hunched over my coffee table, maybe fly through a city on Google Maps while eating breakfast. I could see it being the next email, or maybe used to replace some service. But then again, I can’t stand it when I have to deal with an automated system over the phone. I always just want to talk to someone. So it’s really about acceptance. I see it as the future, but I’m guessing the road will not be smooth. Kirill: There are also plenty of primary and supporting screens in “Mockingjay.” How much work goes into creating a consistent design system and visual language for them as opposed to “hero” interfaces that get more foreground screen time in the final cut? Jay: The hero screens usually require more design time as they have specific story points to convey. The secondary screens are always taken into consideration and must tie into the overall design scheme. Jay: Not one bit. I watch the original “Tron” and I’m still impressed with what was possible at the time. I think our work will be judged accordingly. Kirill: Stepping back into the world of real life software, what are the tools that you’re using? What are your main pain points? What can be made better in the way we communicate and interact with computers and screens around us? Jay: At Cantina Creative, we use Adobe After Effects and the Adobe suite, as well as C4D. The holograms for “Mockingjay” were all done with C4D. A major pain point for me is speed: the faster, the better. I can’t wait for the day computers work as fast as I need them to. Jay: Very much so. As a huge fan of Formula One racing, I’m always frustrated at the limitation of watching one, maybe two images on the screen and being forced to watch a feed that is decided for me. We should be able to watch whatever camera we desire. If I were able to experience sitting in the grandstand, or behind the wheel of my favorite driver, it would change the entire experience. I would love to throw on an Oculus Rift, and toggle between 30 cameras around the track, allowing me to watch the race at different locations. VR is a game changer in my opinion, and I am happy to be at the very beginning of it all. Jay: Change is always a step up, no matter how small the step but I would prefer it if companies took it a bit slower and make bigger leaps. The small increments are financially driven, and the business model does work – as long as the small steps, don’t take away from the big steps being taken behind the scenes. And here I’d like to thank Jay Grunfeld for graciously agreeing to do the interview and answering a few questions I had about his craft. You can find more of his recent work at Cantina Creative site. And if you’re interested to read additional interviews about the wonderful world of screen graphics and user interfaces for film and TV, click here for more.